Private golf course owners must compete for customers with courses subsidized by their own tax dollars. Aside from being unfair, this is economically counterproductive. Since taking office Gov. Granholm has sliced more than 9 percent from the state’s annual revenue sharing to counties, villages and townships to help balance the state budget. Michigan’s local governments will need to make up the revenue shortfall somehow. One option is to privatize assets they own or services they provide, such as public golf courses. Municipal golf courses are expensive endeavors that can bleed municipalities of much-needed cash. They represent untapped assets that could be sold, generating revenue from the sale, and adding property to a municipality’s tax rolls. Perhaps most important, municipal courses compete directly with private, for-profit courses for customers, and do so using the tax dollars of private golf course owners. And from a “good government” point of view, government-run golf is, as Governing Magazine has said, “the most nonessential of nonessential services.” Can anyone seriously claim “golf” as a legitimate government function? Last year city officials stripped its police protection fund of $500,000 in surplus revenue to help finance a $1 million clubhouse for the course. The state of Michigan, despite its long winters, is a golf Mecca. According to the National Golf Course Owners’ Association, there are 854 golf courses in Michigan — the third-highest number of courses in the country. In number of courses per capita Michigan ranks 14th in the nation. In other words, if every one of Michigan’s 81 government courses vanished, there would still be enough courses to accommodate demand. Yet there have been few public discussions about privatizing government golf courses to save money. Even when officials do discuss privatization it generally involves contracting with private management companies to operate facilities still owned by municipalities. While this may save taxpayer dollars and improve services it doesn’t go far enough. Local units of government should sell off their golf courses completely. Taxpayers should never have to foot the bill for facilities that serve no legitimate government function. Even courses that have long since been paid for and generate revenue exceeding their true expenses represent untapped assets with substantial opportunity costs. That is, the revenue generated by a sale of the property, plus all future annual tax payments generated by private owners, are forfeited so a few thousand golfers can enjoy one more golf option each summer. Take the Fieldstone Golf Club of Auburn Hills as an example. It is situated on some of the most valuable land in the state of Michigan, just south of the Palace of Auburn Hills (where the Detroit Pistons play) near Interstate 75 in Oakland County. 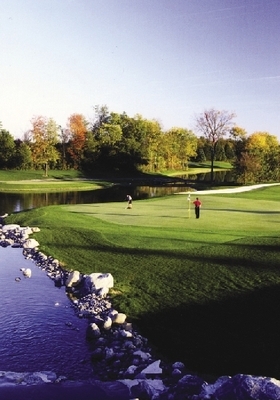 It cost the municipality $16 million to purchase in 1997 and, according to Tom McMillin, former Auburn Hills mayor, the course has officially bled the city of about $1.5 million in revenue since January 2000 by generating less income than was necessary to cover the cost of running the facility. The losses incurred at Fieldstone are paid for by loans from other areas of the city budget. Once the golf course starts making a profit it is expected to pay this money back. The city golf course officially owes $2,000,000. The city of Auburn artificially brightens this negative picture by including property tax revenue generated by 100 acres adjacent to the course as revenue generated by the golf course itself. It’s a complicated issue that requires some explanation. The city’s logic is that, if it had not bought the course, the private development of the adjacent acres would not have occurred. This is unlikely given the demand for land in the area. In 2004, this adjacent property is expected to generate $385,000 in property tax revenue. Without this money on the city’s books as golf course revenue, the actual deficit of the course would be much higher than $2 million. Fieldstone also counts as revenue an “advance,” or loan, equivalent to the property tax bill generated by the property from its owners. The property taxes and advance from the property owners totaled $770,000 in the city’s 2004 proposed budget. This dramatically boosts Fieldstone’s revenue profile, and makes the golf course appear like a better city investment than it actually is. Why would a local business make such a loan? According to William Ross, city manager of Auburn Hills, such support evolved from a public-private partnership between the city of Auburn Hills and Cardell Corp., an automotive parts supplier. When the course originally went up for sale in the late 1990s it was purchased by Cardell Corp. which kept a portion of the property for its business and sold the course to the city of Auburn Hills. Furthermore, last year city officials stripped its police protection fund of $500,000 in surplus revenue to help finance a $1 million clubhouse for the course. These revenues are not accounted for on the Fieldstone balance sheet as they would be if the course were privately owned. A for-profit operation would have to use capital it accumulated through its operation or borrow the money if it wanted a new clubhouse. What it couldn’t do is force taxpayers to fund it, or legally conceal its true cost. Some maintenance costs associated with municipal courses are shielded from public view because some courses use Department of Public Works employees or inmates from jail work-release programs to do landscaping, or pick up after severe weather drops tree branches and leaves on the course. These costs do not show up as part of a municipal course’s expenses, but they should. Selling Fieldstone to private developers would enable the city to re-deploy the annual property tax revenue it now uses to subsidize the golf course. And if a 100-acre business development adjacent to the course generates $385,000 in tax revenue, it is not unreasonable to suggest that the 280-acre course might produce double that amount annually, if it were converted to similar business enterprise. The Fieldstone example is not unique. Consider the new Lyon Oaks County Park municipal golf course, with 18 holes and a 30,000 square-foot banquet and conference facility. According to Dan Stencil, administrator of park operations, the course cost $13.4 million to build (this price excludes other new park features such as the dog park). In 2003 the course had a built-in loss — in other words, the county expected the loss and budgeted for it — of more than $200,000, but was expected to make a profit of $84,000 in 2004. That is, it will “profit” if you exclude from the profit and loss ledger the cost of paying off its debt service, which Oakland County does to the tune of $400,000 annually. Of course, excluding such costs makes the operation of the municipal course appear more cost effective than it really is. There is another, perhaps more pernicious cost associated with municipal golf. It is unfair to private municipal golf owners to use their tax dollars to create golf courses with which they will have to compete — and on an unfair basis to boot. If for-profit ventures fail to generate revenue in excess of expenditures they eventually go out of business. Municipal operations just reach deeper into the pockets of taxpayers. As municipalities strain to pay the most essential bills common to operating a local unit of government, those that operate golf courses should consider selling them before raising taxes. Certainly they should stop complaining about state revenue-sharing cuts if they do not intend to cut a “government function” so clearly not essential to good government. Indeed, municipal golf courses represent an embarrassment of riches for the governments that run them. Currently, all levels of government combined take about 40 percent of national income, jobs are leaving the state of Michigan, and local budgets are reportedly strained under the weight of a struggling economy. Under such circumstances, taxpayer funded golf seems both wasteful and unfair to taxpayers and entrepreneurs. There may be some benefits to government golf, but those are concentrated among a few golfers and city employees who work at or enjoy operating a golf course. Private businesses provide golf services without reaching into the pockets of non-golfers to do so. 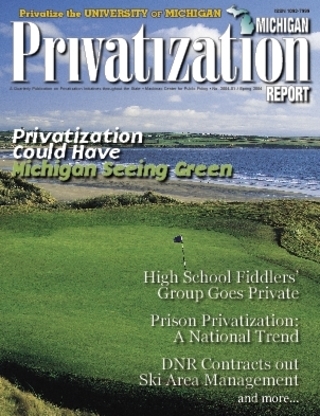 Golf privatization is more than just smart economic policy. It is fair to real entrepreneurs who risk their own money in order to provide these services.